We’ve teamed up with the Water Authority to offer a series of new WaterSmart Gardening classes! Check back regularly as we post class content throughout the season. For many people, gardening is a quiet, relaxing hobby that helps them feel closer to nature. However, many gardening practices don’t positively affect nature to the extent we may believe. For example, Americans use nearly 7 billion gallons of water per day on landscape irrigation, which is about one-third of all the water Americans use each day. Using that much water puts a strain on water supplies and impacts natural resources in other areas. 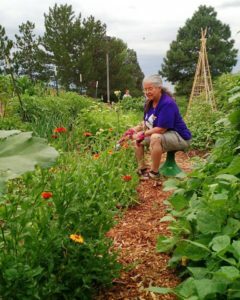 Gardeners also impact the environment in unintended ways by planting non-native plant species, which can affect populations of local plants and even wildlife. Eco-friendly gardening is becoming more popular as people across the country look to enjoy the benefits of gardening while reducing the harmful effects it may have on the local ecosystem. Through careful planning and good habits, backyard gardens can be a boon to the environment as well as their owners’ mood and well-being. A rain barrel can be kept close by to collect rainwater for watering a garden without depending on outside water supplies, for example. Planting certain types of wildflowers also can help attract birds and helpful insects that can eat harmful pests, which reduces the need for chemical pesticides. Environment-friendly gardening is easy and just as much fun, while having the added benefits of helping preserve the ecosystem. The tips in the accompanying checklist can help you practice eco-friendly gardening in your backyard. Take a look and see what you can do to make your garden more of a help to the environment. Elderberry is a plant closely rooted to human development. With several varieties found across the globe, many communities have used its flowers and berries for medicinal and culinary purposes for hundreds of years. Though there are many types of Elderberry, the one that grows especially well in the Southwest is the Mexican Elderberry (Sambucus mexicana). Reaching 15 feet tall in maturity, it can be used in residential or commercial design as a shrub or tree. With its beautiful cream colored flowers in spring and summer and it’s dark purple fruit in fall, Mexican Elderberry can become a valuable addition to any space. In addition to its aesthetic appeal, the fruit and flowers of the Elderberry provide numerous health benefits. The berries are high in nutrients and antioxidants which help reduce inflammation, reduce damage from oxidative stress, and protect the body against free radicals from pollution. Multiple studies have also shown that Elderberry flower infusions and berry extracts aid in helping the body fight against influenza virus and soothe symptoms. Elderberry extract lozenges were found to reduce symptoms like headaches, fever, body aches, and congestion in 24 hours of consuming. Repeated doses of Elderberry syrup boosted symptom recovery in 2-4 days. These remedies can be used as a natural alternative to other commercial medicines available to treat influenza and the common cold. In food, Elderberry can be used in jellies, pies, and homemade wine. It is important to note that before consuming, berries should be cooked to help the body digest them better. Here at the gardens we look forward to turning our Elderberries into syrup and the flowers in homemade loose leaf tea! If you don’t have an Elderberry tree in your backyard, look into local foraging laws in your area to determine if harvesting Elderberry in public spaces is a viable option for you. Whether it’s in medicine or food, Elderberry is definitely a multipurpose beauty! Emma Jones is a student at Utah State University studying Conservation and Restoration Ecology with a double minor in Sustainable Systems and Sociology. Beans and rice speak to her soul and she attempts yoga on a regular basis. Hornworms are a problem many who grow tomatoes will encounter. Many people loathe them for their habit of eating loads of plant material at a time (though I don’t understand how anyone can hate something so cute). The name Hornworm often refers to a large green caterpillar pest, named for a harmless “horn” at the end of their bodies. These caterpillars are not simply pests however, because their chubby, voracious caterpillar state is only temporary. These larvae are destined to transform into Sphinx Moths. Sphinx Moths are a family of moths (Sphingidae) that includes about 1,450 discovered species, including your average Tomato Hornworm. You may find Tomato Hornworms, the Five Spotted Sphinx Moth, on your plants, or perhaps the closely related Tobacco Hornworm, both species in the genus Manduca. Either way however, you are likely to encounter a number of other species, many of whom are not pests, all of whom are remarkable. Sphinx moths are distinguished by their large size and whose fast flight makes them resemble hummingbirds. These moths are good pollinators, and some are even the sole pollinators for a plant species. They also have characteristically little feathering on their antennae, unlike many moths. Quite a few species are colorful, and some diurnal species mimic bees or hummingbirds. In the DOT Garden, and across New Mexico, White Lined Sphinxes are quite common. You may see one of these elegant moths sleeping on random surfaces, or hovering around flowers, feeding. Written by Vilheim Piwowarek, resident entomologist of the DOT Garden. As an insect enthusiast and insectivore, he is very passionate about understanding insect roles in the Garden, alternative pest management, undercutting insect-related misconceptions, and staring at insects for hours at a time. He is starting his Senior year high school. Garlic is amazing! Along with being delicious to eat and great to cook with, it also has many benefits other than its tasty insides. For example, eating garlic can reduce your cholesterol. Vitamins, minerals, and antioxidants are also contained in garlic. Potassium, iron, vitamin C, and calcium are just a few of the nutrients that you benefit from when consuming garlic. Additionally, If you cut the cloves of garlic in half and directly apply to your skin, it can help get rid of acne and cold sores. In fact, garlic has been used as a health aid since ancient times. In the garden this summer, I helped harvest and clean garlic. The type of garlic that we harvested in mid-June is called Spanish Roja. To harvest, we loosened the ground around the garlic so it could be pulled out of the ground. We were very cautious to not dig into the vegetable with our shovels. We then carefully placed the garlic in a pile. If we tossed the garlic too vigorously on the ground, it could bruise. Once all the garlic was harvested, it was placed on racks to be dried. In addition to the process of harvesting the garlic, we also had to clean it. After a few weeks of drying on a rack we began cleaning another type of garlic called Tashkent Violet Streak. To clean the garlic we cut off the stems about an inch from the garlic itself. Then we peeled off the outer wrapper of the garlic which was covered in dirt. Finally, we trimmed the roots as far up as we could without hurting the garlic. When all of the cleaning was done the garlic was set on the drying rack once more. These vegetables were now ready to go to be sorted into seed stock and food for the CSA. I had no idea that harvesting garlic was such an intricate process. I have learned that farmers take time to provide quality food to our families. I definitely have more appreciation for the farmers that deliver the food to our tables. Diego Moore is a rising sophomore at Albuquerque Academy. Self-proclaimed lover of puppies, kittens, rainbows, and Lucky Charms, Diego also has a passion for music and plays guitar in a band through School of Rock here in Albuquerque. If you’d like a PDF of the powerpoint, check out the link below. While having a fun time weeding one day, I was very excited (and perhaps would be alone in my excitement) to see a species of a unique and obscure insect group in the garden. The bane of some farmers, though not a problem for us –Thrips, specifically Mullein Thrips (Haplothrips verbasci). Never heard of a Thrips? (yes, Thrips is singular!) That’s ok, neither has Microsoft Word, as I just found out. Thrips are an order of insect, Thysanopterans. They feed on plants and sometimes other insects. Their bodies are often tiny dots less than a millimeter in length. If you ever get the chance to see one closely, they are usually darkly colored, thin elongated beings that, frankly, don’t look too remarkable. However, Thrips are very unique, primarily due to their wings. Thrips have fringed wings that are thin with jutting hairs, that make the resemble feathers. While their wings may appear incapable of flight, the design of Thrips’ wings allow them to use a type of flight called Clap and Fling, a feature unique to them and certain wasp groups. Rather than normal flapping, these little guys clap their wings together, then fling them apart, hence the name. This motion creates a vortex that pushes the tiny insect aloft, as they fly into the sunset. We filmed this class! Video content will be added in the next few weeks.